Cyrus was so engrossed in what he was doing that the sound of the car coming up the long driveway, the press of tires on gravel muted by the first leavings of the snowstorm, had barely registered on his senses. He was standing atop an extension ladder in front of the chapel door, doing his best to maintain balance while holding above his head the eight-foot-long board that was about to become the chapel’s nameplate. The weather to which the approaching visitor had alluded was most decidedly not helping Cyrus in his efforts. A mid-March snowstorm had been forecast to begin today and was expected to dump as much as ten inches by the time it abated tomorrow evening. It was now approaching noon and the slate sky had begun unloading right on schedule, with already a half inch on the ground and the flakes getting noticeably bigger with each passing hour. But for Cyrus, there simply was no choice. Snow or no snow, the chapel’s inaugural service was scheduled for this coming Sunday—just six days away—and he was determined that there would be a name on the chapel before folks arrived, regardless of whether the assembly comprised two or two hundred. At the moment the stranger had driven up, Cyrus was balanced precariously atop the ladder’s top rung, doing his best to hold up the awkward sign board while securing it with a screwdriver and leaning back as much as he dared to ensure that the result would be level. Without turning to acknowledge the speaker, Cyrus replied. “Do me a favor, sir, and tell me if it’s straight or not.” He did not dare to look back over his shoulder to see with whom he was speaking. “Bring your right side down a skosh,” the man said. His voice was deep and carried clearly through the crisp midday air. Cyrus had been a Wellington resident for barely more than a month, but he had a pretty good idea who he was conversing with without even looking. With a final twist of the screwdriver and a quick tug to ensure that the sign was secure, Cyrus thrust the screwdriver into his pocket, gripped the top of the ladder and turned to have a look at his visitor. It was the first time he’d laid eyes on McKinsey, but the reports he’d received from Ruthie and a handful of others he’d come to know in town had been dead-on. The pastor was an imposing, borderline intimidating, figure, well over six feet and well above two hundred fifty pounds, even taking into account the heavy winter coat he was wearing. Cyrus had on nothing more than a heavy flannel shirt, despite the twenty-degree weather. Cyrus was only too happy to oblige. He descended, offering the big man an outstretched hand before pulling down the ladder and placing it for the moment to one side of the chapel entrance. He opened the front door and gestured McKinsey on ahead of him. “Much warmer inside,” Cyrus said. “Our nice new furnace is finally getting a workout.” He drew the door closed behind them and stomped his boots hard on the newly installed entry rug. It would not do, he had thought a couple of weeks back, to have the nice new burgundy runner tracked up with winter snow and mud. Numerous accouterments had been added since Cyrus initial visit with Frank five weeks earlier. There was a long row of coat hooks across the back wall and a table for the display of church bulletins and other pertinent documents and handouts. “So, to what do I owe the honor?” Cyrus asked, leading McKinsey down the center aisle, the larger man looking around and nodding approvingly as they walked. “Well, I’m certainly learning fast,” Cyrus replied. He opened the door to his office and gestured McKinsey in ahead of him. There were now bare but functional furnishings, including a desk with lamp, a few chairs, a bookcase, and a small side table on which sat a welcome item on a day such as this—a coffee maker. He poured two cups from the steaming pot, placed one on the table before his guest and took the other around to sit behind the desk. McKinsey removed his coat, placed it over the back of another chair, and took a seat before the desk. Without waiting for an answer, McKinsey drew from his shirt pocket a folded yellow sheet of paper, which Cyrus immediately recognized as one of the several hundred flyers he had had printed at the local copy shop, a single page announcing the opening of the new chapel and inviting all to attend. He drained off the remainder of his coffee cup, then rose and reached for his coat. Cyrus rose as well and stepped from behind the desk to accompany McKinsey out the office door. They arrived at the front door and Cyrus drew it open to see a fresh two inches of snow on the front porch. He extended a hand and McKinsey accepted it before turning to leave. With the weather well and truly closing in for the remainder of the day and evening, Cyrus’s plan to spend the afternoon distributing more of his invitation flyers appeared defunct. Even if he was prepared to trudge around in the snowstorm putting them on windshields, there would be precious few cars out in the gathering weather and any paper left out on a windshield for more than ten seconds would be ruined anyway. He had printed five hundred of the flyers and had already gotten more than half of them onto vehicles in town. He could distribute the remainder after the storm abated, most likely Thursday morning by the looks of things. He had also placed an ad in the local newspaper and shaken more hands at local restaurants and stores than he could count, each time proffering a personal invitation, feeling more like a politician than a pastor. Despite all of it, he had no solid way of judging whether this Sunday’s inaugural service would be attended by a crowd or no one. Still, he had committed to himself that so long as there was a single warm body in a pew, the service would go on as scheduled. For now there was little he could do but pour himself another cup of coffee and try to make a bit more progress on his projects in the cellar. He stepped to one side of the snow-covered porch and retrieved the ladder, its rungs each now coated with fresh white powder. He lifted the ladder, turned it on its side, banged the snow off and carried it gingerly inside. It was an awkward thing to get up and down the cellar stairs and as Cyrus wrestled it back down he wondered if with the coming of spring it might not be a good idea to consider constructing some sort of equipment shed. In his first month of work, Cyrus had spent any spare time not studying and preparing for services down in the cellar. He was good with tools and especially good with lumber, something he had his father to thank for, a father who had placed a power circular saw in the hand of his five-year-old son, informing his horrified mother that it was never too young to start learning to be handy. Cyrus had already put up a couple of new walls downstairs, one directly behind the staircase that split the cellar roughly in two, and a second that partitioned off the furnace area. This left a small room in the front corner that turned out to be just the right size for an impromptu bedroom, for those long nights when he might not make it back into town to his apartment. With the new walls complete, Cyrus had begun putting up floor-to-ceiling bookshelves around the entire perimeter of the larger open rear section of the cellar. As time went on, there would be no shortage of things to store—bibles, hymnals, pamphlets, and office supplies, as well as his collection of tools and materials. He had already completed the shelving along both side walls and would, this snowy afternoon, tackle the remaining task of constructing shelving across the front wall, directly beneath the upstairs pulpit. Since his quick tour of the cellar on that first day, Cyrus had not given much thought at all to the strange business of the warm center section of the rear cellar wall. But now, as he placed his bare left hand firmly against the concrete surface to brace himself for drilling anchor holes in the block, there it was again, a distinctly warmer feel in just this narrow section near the center of the wall. Later on, he’d be hard pressed to say why, but at this moment it occurred to him to explore this curiosity a bit more. He set the drill on the cellar floor and picked up a hammer. Carefully walking from one side of the rear wall to the other, he tapped with the hammer every few inches. Ten or so feet in from both sides, the only sound was the dull thud of concrete block backed by the frozen earth of a deep New England winter. But that center section, with its scarcely perceptible increase in temperature, admitted a distinctly different sound, just a bit more resonant and less solid than the rest. For Cyrus this had now advanced from a slightly curious anomaly to a downright intriguing one. He reached for the drill. Figuring there was only minimal damage that a small hole could do, damage easily repaired with a bit of caulking, he began drilling into the concrete block in the center of the wall. The masonry bit was new and sharp and it took just a minute or so for the bit to bottom out in the hole. But the blocks comprising the wall were thicker than his bit was long. Cyrus did not have a longer drill bit and he was uncertain whether the hardware store in Wellington had one. In any event, the roads were in no condition to try driving into town to find out. 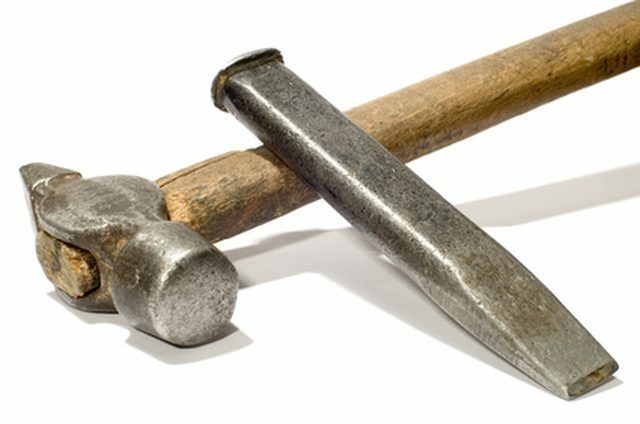 He did, however, have a hammer and a masonry chisel, and he promptly set to applying these to the task of widening the initial hole to the point where the drill could be inserted more deeply. The concrete blocks were new and hard and it took over an hour of chiseling and one twice-banged thumb before Cyrus had expanded his initial hole to a couple of inches in diameter, enough to allow deeper insertion of the drill chuck and masonry bit. This time the drill cut just a few more inches in before suddenly losing all resistance and pushing out the back side of the block. What Cyrus expected to see when he extracted the drill bit was some combination of frozen dirt and perhaps a few bits of fabric from the layer of weather insulation that builders place against the outside of a buried concrete wall before backfilling it. Instead there was nothing but the thick white dust of the ground concrete. He set the drill on the floor, flexed his strained fingers a few times, and lowered his head the small amount required to attempt peering into the hole. The drill bit was, though, just a half inch in diameter, and all Cyrus could see through the hole was blackness. Stepping for a moment to his collection of tools near the staircase, he selected a large carpentry nail, returned to the hole and gingerly pushed the nail into the hole, letting it fall out the back. It fell freely and made a faint metallic sound upon striking whatever was at the bottom of the other side of the wall. Well, thought Cyrus, I’m no builder, but that doesn’t seem right. There was no flashlight in the cellar, but Cyrus had one in his car. Moments later, making his way back down the stairs, brushing snow from his hair, he was once more at the tiny hole, shining the light into the hole. It was, though, impossible to get both the light and his eye simultaneously aligned at an angle that would allow him to see anything. He was clearly going to need to go bigger on the hole. Before committing to this course of action, one more thought occurred to him. He rummaged once more through his assortment of tools but didn’t find what he needed. Climbing the stairs once more, he went to the back office and found a wire coat hanger on the back of the door. Back downstairs, he cut the wire and straightened it into a roughly two-foot length of heavy wire, perfect for prodding. He inserted it carefully into the newly drilled hole until a good foot and a half of the wire extended out the back of the block. There was nothing at all back there, nothing but air. With a doubtful glance at his single tube of caulking, he extracted the wire and reached once more for his hammer and chisel. By focusing his attention on the mortar holding the blocks together, rather than on the blocks themselves, he was able to completely remove a single block with about an hour of additional work. One final vigorous blow of his hammer, and the entire block slid backward and fell through the hole, landing with a crash on whatever hard surface passed for a floor on the other side. The next surprise was that the air on the other side of the rectangular hole was distinctly warmer than what was currently outside. Also, Cyrus noted, placing his face close to the hole, it had a distinctly unhealthy odor to it. He couldn’t quite identify any distinct smell, but it was unquestionably worse than the good clean New England air through which the snow was falling outside the chapel walls. Cyrus’s next surprise came once he set down his hammer and chisel and again picked up his flashlight. The flashlight was not an especially powerful one, but the batteries were new and it cast enough light to allow Cyrus to see something utterly unexpected when he peered through the now expansive rectangular hole. In the flashlight’s glow, he saw an immense black opening when he looked straight ahead, but to either side the rough stone walls of a cave of some sort. There was no way to discern its depth, as the light illuminated only the first ten feet or so of the opening. But a thought immediately occurred to Cyrus; there was no way this foundation could have been dug and the cellar walls installed without the construction crew having discovered and intentionally covered up this opening. He made a mental note to ask around in town and see if he could identify anyone who might have worked on the building’s construction. In the meantime, one thing was now beyond clear; it was unthinkable that his curiosity was going to allow him to leave whatever was back there unexplored.